UltraLite AVB can also be used as a standalone digital mixer. MOTU has expanded its range of UltraLite audio interfaces by shipping the UltraLite AVB. This portable audio interface promises more I/O and more DSP than previous UltraLite's, while delivering "best in class" audio quality. On the I/O front, there are now separate mic and guitar inputs (two each), 8-channel ADAT optical (switchable to stereo TOSLink), 6 x 8 balanced 1/4-inch analogue I/O and MIDI In/Out jacks. That equates to 18 simultaneous inputs and outputs. The redesigned console-style mixer can now access double the processing power. The mixer provides 48 inputs, 12 stereo busses and 32-bit floating point effects processing (modelled analogue EQ, vintage compression and classic reverb are all included). There are flexible routing options, and the UltraLite AVB can also be used as a standalone digital mixer and controlled wirelessly from a range of mobile devices. The UltraLite AVB connects to your computer through AVB Ethernet or audio class compliant hi-speed USB 2.0 (it's also compatible with USB 3.0 and iOS) and records at sample rates up to 192kHz. The AVB Ethernet connection can also be used to add additional MOTU AVB interfaces to your system or to connect to an expanded MOTU AVB network with multiple interfaces and computers. 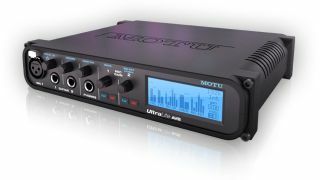 You can find out more about the MOTU UltraLite AVB on the MOTU website. The US price is reported to be $649.